Wedding vows are an integral part of any wedding ceremony. There are beautiful traditional ones that you can borrow. But you can supplement – or even replace – them with ones you write yourself. Yes, I can imagine your reaction! “I’m not writing my own vows!” Or, at the very least, you would point out that most of us are not born writers. How can you possibly write your own wedding vows?! One of the beautiful things about working with a civil celebrant is that your ‘script’ can be exactly what you want. And, although there are some lovely vows you can borrow or adapt, writing your own marriage vows can prove to be personal, moving and even emotional. No one wants to risk producing ‘naff’ vows, so here are ten tips to help you. Do ensure you and your partner BOTH want to do this, and agree whether you will do this separately or together. Make sure that the person conducting the ceremony knows in advance. And it’s OK for them to look at what you have written before the ceremony. Allow loads of time to prepare your vows – you’re bound to need to do plenty of rewriting. Start by deciding a few general things you want to say (you can worry about the detail later) – just have clear in your head what it is important. What sort of register do you want to use? By that I mean: will the tone be serious, humorous, deep, spiritual, religious, or some sort of combination? Once you’ve got a few sentences down (and remember, sixty seconds each for the whole thing can be quite long enough! ), see about reworking them so they look and sound good to you. Leave your draft a day or two, and come back and, if necessary, rework it. You can ask a friend to review it – but they must be honest! Once you’re satisfied, practise reading the vows (alone!) in front of a mirror – or practise with your partner. 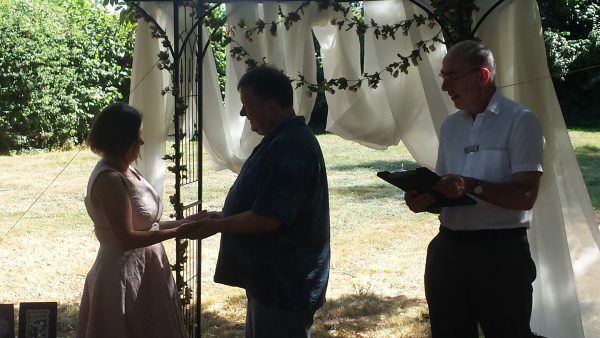 At the end of the ceremony, give the vows to somebody to keep for you (or make and file a copy beforehand). When you deliver your vows – whether you read them, follow notes or repeat after the celebrant – don’t forget to look into your partner’s eyes! I shall write about content another time, but, you see, the principle is not really that hard after all!